MMORPG’s On Consoles: Where Are They? Google search "MMORPG for Xbox 360". Now, I'm a huge MMORPG fan for the PC and I've played literally every release since around 2007 and its always interested me as to how the console market could implement the structure, playability, and experience on a console that I feel whilst playing on the PC. However my google search came up with chicken feed. Literally nothing about any MMORPG games on Xbox 360 and in fact most consoles. The best I got was somebody asking the same question as me and getting laughed at on a forum. Well today I'm going to look at why this is the case. The first MMORPG game that I played was Everquest. I joined the ride quite late and started playing it in 2004. The game was released in 1999 and is considered as one of the pioneers for online role playing games. This means that in 13 years there has still been no advance with MMO's on consoles. The closest I can think of is the Phantasy Star series of games. The Dreamcast version (Episode 1 & 2) was I believe the first MMO to ever be released on a console, and boy that game was awesome, even on my 56k modem. It was re-released for the Gamecube & Original Xbox which had Broadband support so the client was more stable and even though the servers have closed I still play on a private server which boasts over 200 active users a day still playing; considering the servers closed a few years back this is pretty awesome. 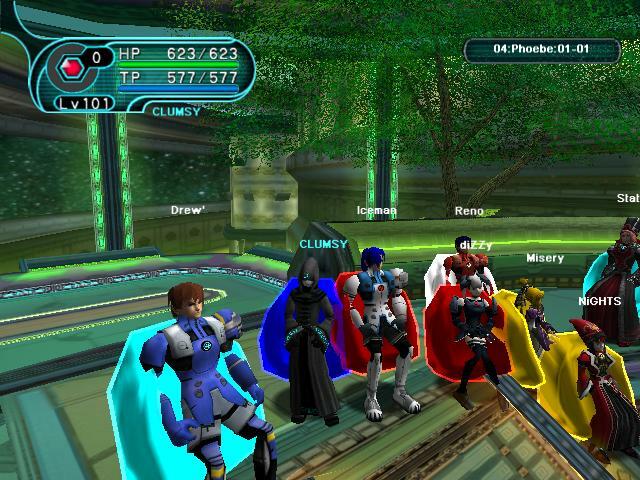 The Phantasy Star series then came to Xbox 360 with Phantasy Star Universe, which in mine and a lot of peoples opinions, was pretty poor. But it was still significant in showing that MMORPG games could "work" in the current gen consoles market. The first thing that springs to mind when looking at this subject is the user Interface. Playing so many MMORPG games I have seen some really good and some really bad UI's. Now that I look at my TV in front of me with skyrim on display, I'm now kind of seeing the first thing as to why there isnt as many MMO's on the Xbox. When you see some of the complexities of a standard MMORPG UI, from say World of Warcraft, It's quite apparent that a keyboard and mouse needs to be used. The most you can get away with on an Xbox 360 controller is using the 4 shoulder buttons and the 4 standard buttons, So that's 8 different key commands. I'm already using 10+ key commands using my mouse and keyboard. Also to make the experience in a similar vein to the PC then is obvious the Xbox 360 would need a Keyboard and a mouse. The keyboard part has been done on the Gamecube and on the 360 but the mouse part, I find quite hard to be implemented. You would possibly need a USB dongle in the 360 and an external wireless mouse, then theres the part of actually clicking stuff on the screen, sitting back and immersing yourself in the game, so much that the control system doesnt bear an impact and you're not even thinking about what to click, You're just naturally doing it. I do this every time I play a game; I already know what buttons to press, I don't even think about it, I just follow whats on my screen. Having a control system using a pad with an MMORPG I feel could be a massive burden. I feel you will be constantly fighting the UI so that the game plays the way you want but it still wont deliver what you want. There would HAVE to be keyboard and mouse support in order to make a MMORPG successful on the Xbox. However, after playing "Tera online" with my Xbox 360 controller there is still hope yeat! The iOS market has been inundated with MMO's like 7 swords & pocket Legends and they have coped, but the hardware would need to support the software if it was to move over to the console. The other problem is the server support. I think at most there are around 800,000 people who play Modern Warfare 2 at any one time, Now that takes a lot of support from their American server. Put that into contrast with World of Warcraft, Blizzard say that have an active player base of around 12 million subscriptions. So that means that possibly around 6 million people are playing at one time. Thats a mammoth server support in comparison to the Xbox ones. This would mean that Microsoft would need to massively increase the amount of servers and tech support if there was to ever be a port of an MMORPG over to the console. To be honest with the market share and money Microsoft have I dont think that this would be a problem. It would also depend on how popular the game becomes. For example, the latest Star Wars MMORPG has recently lost around 700,000 subscriptions since its release, Including myself, and have now merged a load of servers down to only a few so that the player base doesn't feel like the world is empty and can actually play with others enjoying the game. If an MMORPG was to port over from the PC market then it would need to already have a great fan base, like for example, World of Warcraft, Guild Wars, etc. in order for the game to become successful. The next and last point on this subject is the subscription issue. The majority of MMO's charge a premium monthly subscription to play their games. Though a lot of games are following the "free to play" model where users can purchase in game items but play the game for free. This has been becoming ever more popular to try and get the fan base up, but some games like Final Fantasy Online, World of Warcraft, SWTOR, Rift, and Vanguard Saga of Heroes still require a monthly charge of £8.99 to play (first month free). I feel this would be a big problem with the Xbox 360. Players already pay a £4.99 charge for the Xbox Live Gold package, and to add another £8.99 on top of this I feel wouldn't work as only a small amount of fan boys for that game would play it and it wouldn't be accessible to the general use. I personally wouldn't pay for this as I already pay for some MMORPG's for the PC. If the cost covered console and PC port then i'd be all for it but I feel that the majority of money that would go into making a console port would need to be recompensed and the companies would do this by charging a subscription fee which wouldn't work. If you're going to port a game over from PC to Xbox 360. developers would be best implementing a free to play mode. The soon to be released Guild Wars 2 could show the free to play model works! To conclude I think there is scope to have an MMORPG working great on the 360. With the announcement of The Elder Scrolls Online for PC this shows that there could possibly be a console version seeing as all of the Elder Scrolls games (since morrowind) have had a console version and this could lead to a Elder Scrolls Online for console in the future. But it would have to be made right. The graphics of a PC will always be superior to that of the console, With ambient lighting and anti analising, I don't think the current gen consoles will cope with the advanced graphics, and would have to cap it at 30 FPS and lose some of the graphical magic seen on the PC. Seeing as the current gen consoles are coming to the end of their tenure with the imminent announcement of the new generation of consoles, maybe its something that could be implemented in the Xbox 720. However, as said before, the hardware and the software support would have to be on par with that of the current MMORPG's and will require a lot of investment from games developers and hardware manufacturers in order to make this genre a success in the console market. Could it be all worth it?